This very easy-going single malt from Auchentoshan is aged solely in American Bourbon casks. I've been drinking this one for a little over two years now and though I enjoy it as a knock off, it certainly won't knock ones socks off. It is a little too inconspicuous in the single malt landscape, lacking the complexity that raises and even the affordable scotches into the memory. Nose- Light caramel notes, mild toasty quality. Palate- Delicate vanilla and caramel. These tones are a particular highlight for me. 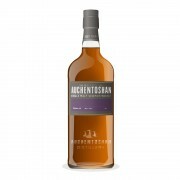 They also constitute the main character of the scotch. Finish- Light sweetness, biscuit, caramel. My only disappointment with this is the lack of complexity. But this is also what makes it my go-to at the end of the night. Nice notes @nicko, thanks for posting! "though I enjoy it as a knock off, it certainly won't knock ones socks off"—nice turn of phrase! @nicko In all my years of drinking Scotch whisky, I have never tasted Auchentoshan, mostly because of typically luke warm reviews such as this. I'm sure there are some very good ones, but they are probably old and expensive. I don't recall anyone gushing over any of their core range offerings. Cheers. @BlueNote , same here, except I did taste one once at a scotch sampling event. I was unimpressed. Though to be fair, it was probably one of their more basic whiskies. @MadSingleMalt Don't ever give up Pogues. @MadSingleMalt I've only ever had the standard 12 and was incredibly unimpressed. All the reviews for the American Oak and the Three Wood seem to be just as lukewarm. I find Auchentoshan to be the Brendan Fraser of scotches. Bland and unremarkable. Not bad, just easily forgettable. Perhaps their eleventy billion dollar bottles are worthwhile, but I'll never know. @nicko, don't forget that if you order your drink "straight up" you will get it poured over ice and strained. @OdysseusUnbound I thought a Brendan Fraser of whisky was a sympathic flashy and nutty whisky, a bit simple and, at the same time, a bit thick even if lacking substance. Well, my mistake. This one has replaced "Classic" here in Australia, which has a similar write up for ex-Bourbon casks. Any information on what the difference is between the two?